Among the many films that center on food at the end of the twentieth century, Babette’s Feast (Babettes Gaestebud) stands out for its reach and for the subtlety of its sensuality. For this film depicts far more than food and foodways; it shows more than the sensuality of food in our lives. Paradoxically, this Danish film tells an exemplary tale of French cuisine. Its portrayal of a French cook far from France evokes the French culinary landscape even more than the Danish countryside where it is set. The fable of French cuisine turns out to be a culinary tale for all times and places, for all those cooks who transform eating into dining, and for all those diners who come away from the table transformed. The immediacy achieved by the moving narrative raises Babette’s Feast to iconic status well above the short story by Isak Dinesen from which it is drawn. Help us celebrate our 10th anniversary with a sumptuous, sensual pot luck feast! BILLY WILDER AT THE CINEMATIKI ONCE AGAIN !!!!!!! HOW NOIR WERE THE FILM NOIRS OF THE 1940’S AS THEY WERE BEING INVENTED BY MASTERS LIKE BILLY WILDER ?? DID IT MAKE YOU RECOIL ?? …COVER YOUR EYES ?? HOW DID THOSE DIRECTORS CONVEY THE STORY THROUGH IMAGES AND DIALOGUE ?????? 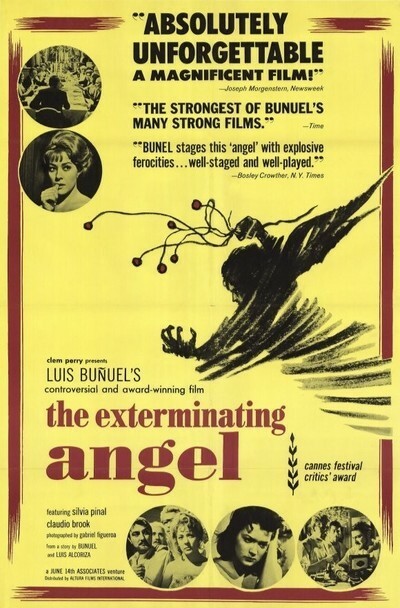 “The Exterminating Angel” (1962) is a macabre comedy, a mordant view of human nature that suggests we harbor savage instincts and unspeakable secrets. Take a group of prosperous dinner guests and pen them up long enough, he suggests, and they’ll turn on one another like rats in an overpopulation study. This Monday will mark our 379th Film. One of our Favorites, this will be our second viewing of Wings Of Desire. Few films, even the greatest ones, are life-changing. It’s just something critics say. But Roberto Rossellini’s Paisan, showing Italy in tatters in the second world war, really did alter the paths taken by two Italian brothers: 17-year-old Paolo Taviani and his 15-year-old brother Vittorio, who saw it in 1946. They made a pledge after leaving the cinema: if they were not shooting films within a decade, they would buy a gun and shoot themselves. Thirty years later, and fully established as directors, they made their masterpiece, Padre Padrone. It won the Palme d’Or at Cannes in 1977, as well as the international critics’ prize – the first picture to scoop both awards at the festival. The jury president that year was the man who had inspired them: Roberto Rossellini. Gritty realistic story told in a stylised, impressionistic, at times Brechtian manner. Padre Padrone, which was made for Italian television, is based on the autobiography by the linguist Gavino Ledda. It details his upbringing in Sardinia at the hands of his father, a brutal peasant farmer, and opens with the real Gavino whittling away at a branch with his knife. The camera pans right to a man approaching a door. It is Omero Antonutti, the actor who will play Gavino’s father. He is about to enter a classroom, from which he will drag his illiterate six-year-old son (Fabrizio Forte) before forcing him to work in the wind-beaten mountains. Gavino hands his screen parent the stick he has been fashioning: “My father was carrying this,” he says. It’s a masterful, Brechtian moment; the baton is passed from reality to cinema. When an English writer finds he has a small inheritance on a Greek island, his joyless existence is disturbed when he meets Zorba, a middle aged Greek with a real lust for life. As he discovers the all the pleasures of Greece, the Englishman finds his view on life changing. The film is also notable for its breezy jazz score by the composer Piero Umiliani, who helped develop the style of the jazz soundtracks now considered characteristic of European films in the 1960s and 1970s.